Dabble was designed with simplicity of use in mind so that you can focus on writing. If you understand just two basic actions that are consistent throughout the platform, you're ready to get started. Move items by dragging and dropping them to their new locations. Hover over the item, click the three dots that appear, and see a menu with all the choices available for the item. Each of these is explained in greater detail below. You can change the order of almost anything in Dabble by dragging and dropping it where you want it to go in the left menu. Never worry about getting your book perfect the first time because editing is a snap. A great feature of Dabble is the ease of compartmentalizing and reorganizing sections of your book. There's no cumbersome refresh or manual process required to renumber your sections, either. It's done automatically for you. Click Chapter 3 and hold your mouse button down. Drag Chapter 3 below Chapter 4 until Dabble displays its new position. Released the mouse button. Note the chapter numbers are automatically updated to reflect the new order. You can verify this by looking at the text in the Scenes. “Not all that Mrs. ...” moves from Chapter 3 to Chapter 4. Even though the Chapter numbering doesn't look different, the content has moved the way that was intended. Dabble takes care of updating your Chapter and Part numbers when you re-arrange your book, so you don't need to worry about it. You can arrange your Character notes so you see the most important characters listed at the top instead of seeing them sorted alphabetically or by the last time you edited the file. You can manually re-arrange your Plot Grids. You might want to see your most recent and detailed Plot breakdowns at the top, but you periodically need to open your old work for reference. Again, the naming convention doesn't matter. You don't need to worry about modifying it and changing the date on the file. You are in control of what you see. Every single item listed on the left side of Dabble offers you a custom menu, so you can see exactly what actions are associated with it. Hover your mouse over the item (move the mouse over it, but don't click), and three dots will appear. Click on the dots, and you'll see your choices. Rename Book: Change the name of your book. Add New Chapter: Add a Chapter to your book. 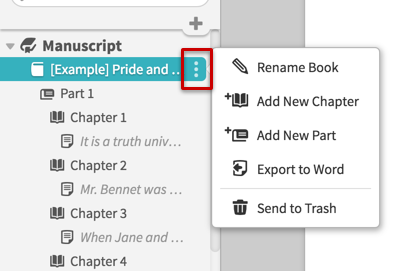 Add New Part: Add a Part to your book (if you want to use them). Export to Word: Export your Book to Microsoft Word. Send to Trash: Surely it won't come to this. The procedure is just that simple for every item listed on the left side of your application, and the choices are just as clear. By the way, this isn't the only way to accomplish these tasks, so don't let this stop you from exploring. If you have mastered the steps in this tutorial, you have the skills you need to use Dabble. For more information, visit the Help Center. That page is also accessible from the top right of the application under the word “Help.” You can also always reach someone to ask for assistance.